I borrowed this concept from Tina Seelig’s terrific book, inGenius: A Crash Course in Creativity. Here is the Innovation Engine. On the inside of your Innovation Engine are knowledge, imagination, and attitude. Your imagination is the catalyst for the transformation of knowledge into new ideas. Your attitude is a spark that sets the Innovation Engine in motion. 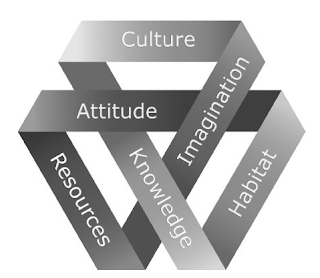 On the outside of your Innovation Engine are resources, habitat, and culture. Resources are all the assets in your community. Habitats are your local environments, including your home, school, or office. Culture is the collective beliefs, values, and behaviors in your community.